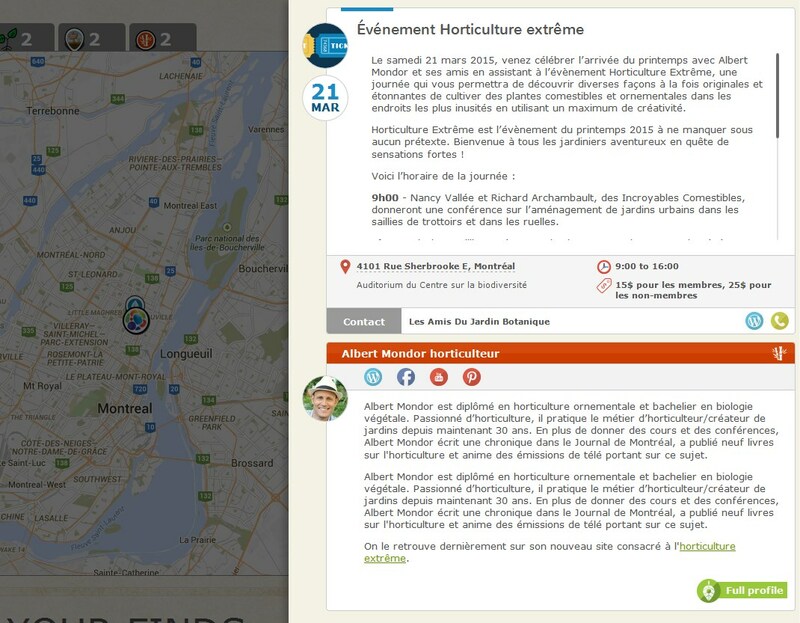 As I was mentioning in my previous post, so far Bamboo accounts were useful for professionals in horticulture and urbain agriculture to highlight their events. This is a good thing, but the visibility of the professional itself has proved to be too short-lived, since when an event is finished he disappears of the map. That's why the Bamboo account had to evolve toward something far more practical. One can see a mini profile (a bit longer than regular ones) on the left, a more complete text on the right and a list of next planned events. 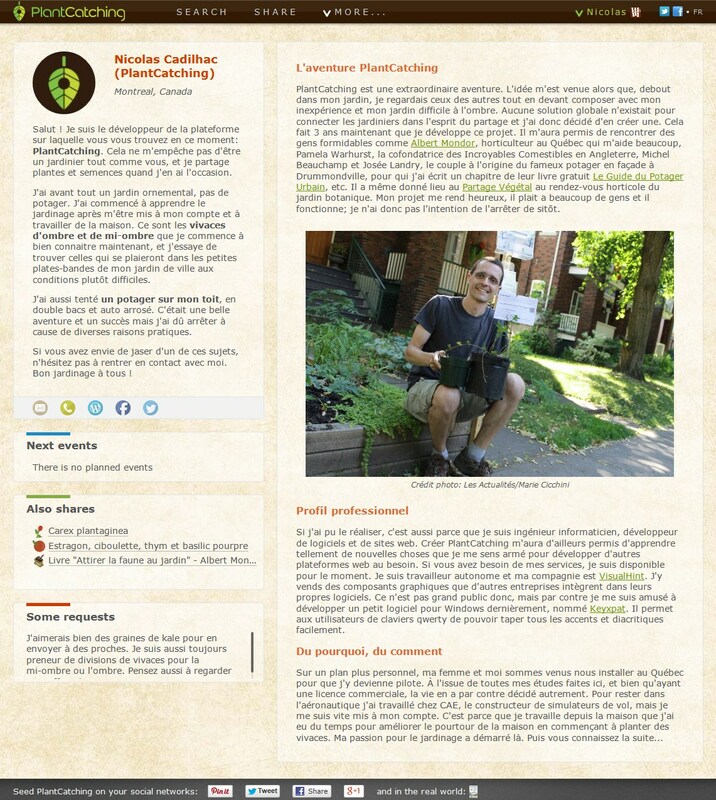 If the Bamboo is willing to share plants, the page will also show a list of his listings as well as requests if any. There are several ways to access this page and it should be well-liked by Bamboo account owners as well as users. The main map is given a new tab, which you maybe already noticed if you have been attentive while reading the article in this series containing a screenshot of the tab. Its goal is straightforward since clicking it will display all Bamboos surrounding you. Be curious: go and discover them. It's a good way to thank them for supporting PlantCatching. Bamboos can be reached through the events they publish on the platform. In the following picture, you can see that the event organizer, Albert Mondor in this case, is clearly visible thanks to his mini profile. Once again, if a Bamboo is willing to share plants or other items, you could stumble upon a profile just by reading one of his listings. On this matter, how best can a professional appear to visitors eyes if he also gives free plants, seeds, and other stuff? For the last way to find a Bamboo, I have really been wracking my brain. I am the first user of PlantCatching (and a dedicated one) and this was easy to stand in your shoes. My strong belief is that I don't want to be annoyed by advertisements. We are on a sharing platform and this is a spirit we won't find everywhere on web sites. There is no reason to sacrifice that, even for the honest goal of supportting this project. Being presented with a banner that shows a company offering a 30% discount is not something I want to experience, even if it's sometimes interesting to know such an offer. I let other communication channels deal with this information. That's why I decided to highlight a professional, not by what he sells or the services he offers, but by his true skills, his passions, the valuable information he shares, and so on. Here are Bamboo Notes. Bamboo notes are little publications of a certain kind that professionals must take the time to write to inform you on a given subject of their own. After reading a note, you may be be curious about this company/organization/person or willing to continue the article by following a supplied link. That way, there is no visual aggression since this note may be useful and informative to you, and anyway, you are not obliged to continue further. Moreover, this is not a nasty popup window. These notes will be displayed under the listings you are consulting. When reading a seeds offer from a gardener nearby, you will maybe be presented with a note about seeds saving written by an heirloom seed specialist. Or on a perennial listing, a note may let you know about the plants that withstand cold temperatures. Notice that I reserve the right to use this place to say a few words in relation with PlantCatching regularly. To inform you is not always obvious because not everyone is on Facebook, want to read the blog or receive my newsletter. This feature is welcome to do so. Ultimately, everyone is winning. Professionals have to play along, it's sure, and there may be an adaptation period to understand this "new way of creating visibility". But I think that this original concept should please them, as it will please the visitor of the site. They will have to realize that you might be interested if they put the effort and take the time to create pertinent notes. Yes, I say pertinent, and there will be a guide, or charter, to ensure that this is the case. If by chance you find some content that does not follow this guide and is commercially aggressive, you can notify me by using the new "non appropriate content" feedback tool that I already presented. Not-for-profit organizations will also take advantage of the Bamboo account. First, I'll give them access to it as soon as they acquire a Bamboo Seedling account (the one for supporting PlantCatching) and if they contact me to request it. From there, they will be able to write a ton of notes using their expertise in their domain and gain in visibility. Profiles, notes and events are usually discovered where the user of the platform lives. But some professionals have a type of activity that let them prefer to be seen more globally. A self-employed worker who writes books for instance, will want to be seen in France and other places even if he lives in Quebec. That's why I added **the Giant Bamboo account". It looks like his little brother, but with distance constraints removed. Albert Mondor, horticulturist, is a Giant Bamboo. He will be keen to write about his new favourite subject, that is Extreme Horticulture, and be discovered outside of Quebec. 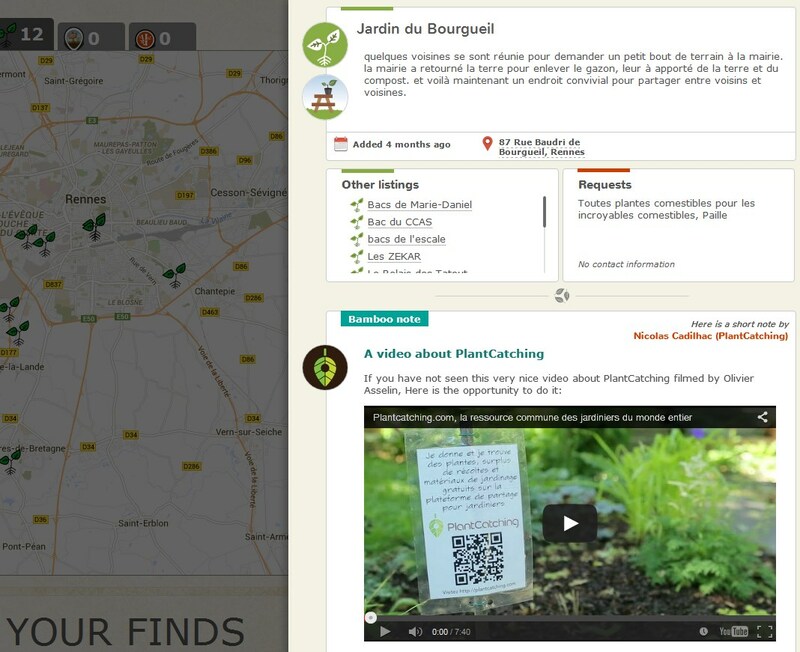 Regular users and professionals, I am waiting for your feedback, so that together we can make these features evolve further and guarantee a durable future for PlantCatching.